Home→Art with a Message→Life in the 32rd. Century! BASED ON SOUND and ACCURATE DATA, WE ARE NOW GOING TO TIME TRAVEL far into the World of Tomorrow!–Not merely a year from now, nor a decade or even a century from now, but 1,200 years into the Future! WORLD CONDITIONS ARE SO DIFFERENT and THE EARTH ITSELF HAS BEEN SO AMAZINGLY and WONDERFULLY TRANSFORMED, that to justly describe it we’ll call it a New Earth!–A virtual paradise compared to the World we are familiar with today! THE CLIMATE OF THE ENTIRE PLANET IS NOW PERFECTLY REGULATED! The harsh temperature extremes which mankind endured in former millenniums are gone, and a lovely, balmy, temperate climate is enjoyed year-round by all of the New Earth’s inhabitants! Violent thunderstorms, hurricanes, tornadoes and blizzards no longer occur.–Nor do any other “natural disasters” such as earthquakes, volcanic eruptions, tidal waves, floods, etc.! BEAUTIFUL GREEN GARDENS and FIELDS COVER THE VAST STRETCHES OF LAND THAT WERE ONCE BARREN DESERTS and WASTELANDS! Crops are always plentiful, and all plagues, blights and insect pests which were once the bane of the World’s farmers have been completely eliminated!–As have all weeds, thorns, thistles etc.! Famine and starvation are unknown! THE BASE OF THIS GOLDEN “CITY” IS LARGER THAN MOST OF THE NATIONS OF THE WORLD TODAY!–1500 miles (2,400 kilometers) long by 1500 miles wide! This incredible pyramid-shaped structure is as high as it is long, thus its peak extends 1500 miles upward, reaching clear into Space!–This is 275 times higher than the World’s tallest mountain, Mt. Everest! THE WALLS, STREETS and DWELLING PLACES OF THIS CITY OF TOMORROW CONSIST OF A BEAUTIFUL CRYSTAL-GOLD MATERIAL which is as clear as glass!–Thus the beauties of the outside New Earth can be viewed and enjoyed from within the City. Having clear golden walls on the housing poses no problem because no one has anything to hide or be ashamed of! It is a perfectly free and open society where Love has united all of the citizens in perfect harmony! ON THE GROUND FLOOR OR BASE OF THIS PHENOMENAL PYRAMID are buildings such as this World has never seen! Many of these buildings house extraordinary educational exhibitions which demonstrate and explain many of the mysteries and wonders of the Universe! Other buildings house amazing machinery and components that help regulate conditions in both the City and outside on the New Earth. But most of the 2,250,000 square miles (5,760,000 square kilometers!) of the City’s base is beautiful heavenly gardens, parks, woodlands and rolling countryside, more beautiful than any in the World today! THE PRIVATE DWELLINGS FOR THE CITY’S BILLIONS OF INHABITANTS are arranged of rows on golden tiers which run along the inside walls of the City. These extend almost to the top of the Pyramid, giving their occupants a magnificent view of the New Earth far below! 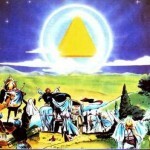 THIS SUPER-STRUCTURE and THE WONDERFUL IMPROVEMENTS and BENEFICIAL CHANGES IN THE WAY OF LIFE for both those who live inside and outside of its clear golden walls are not the result of some great scientific or technological breakthroughs of the future!–In fact, as incredible as it may seem, this great golden Pyramid is already created and is on its way to Earth from distant Space right now! “I JOHN, SAW THE HEAVENLY CITY, NEW JERUSALEM, COMING DOWN FROM GOD, OUT OF SPACE!–And I heard a great voice saying, ‘Behold, the City of God is with men, and He will dwell with them! 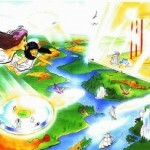 '” (Rev.21:2,3) This great Heavenly Space City is on its way to Earth right now! 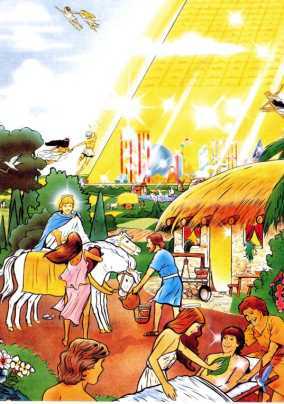 INSIDE THE WONDERFUL GOLDEN CITY, ALL OF GOD’S SAVED CHILDREN WILL LIVE WITH HIM FOREVER! 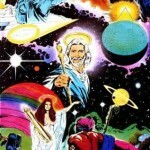 They will all have supernatural, powerful, Heavenly super-bodies which they will receive very soon when Jesus Christ returns to rescue all of those who love and believe in Him from the evil forces which are now taking over the World and will soon be ruling it with their Antichrist One-World Government! OUR BODIES WILL BE JUST LIKE OUTSIDE THE CITY ON THE BEAUTIFUL NEW EARTH, THERE WILL BE WHOLE NATIONS OF OTHER RESURRECTED PEOPLE whose bodies will probably be a little more like the bodies that we have now than the powerful bodies that the Saints will have then. (Rev.21:24-26; 22:2) These folks outside don’t yet live in the City because they didn’t receive God’s Son Jesus–perhaps because they never heard or understood the Gospel. 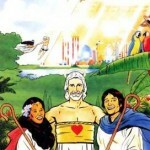 But here on the New Earth they will learn to know and love Him at last! 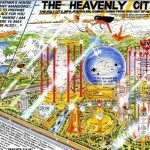 WITHIN THE HEAVENLY SPACE CITY WILL GROW THE “TREES OF LIFE”, which have “Leaves for the healing of the nations.” (Rev.22:1,2) Apparently the folks outside of the City will still need some kind of healing, so the Lord is going to mercifully send His supernatural Saints out to the New Earth to bring them these Leaves!–Like the beautiful couple in this picture, who rode their heavenly horses to the cottage of this New Earth family. The pretty Saint from the City is pressing a magical Leaf from the Tree of Life against the bosom of the grateful young man who is instantly healed thereby! IT’S THRILLING TO REALISE THAT WE WILL STILL HAVE A JOB TO DO and won’t just be floating around on clouds playing harps and doing nothing, like some lazy churchy cartoonists imagine! There will be a whole World of people who will still be learning about the Lord and His Love and will be receiving healing and teaching from the Heavenly Saints! 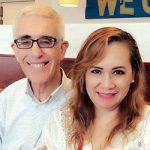 BUT WHY WOULD ANYONE WANT TO LIVE A NATURAL LIFE OUTSIDE ON THE NEW EARTH when they could live a supernatural life inside the great Heavenly City itself?–Enjoying it and all of its marvels and pleasures in their resurrection super-bodies! To become a resident of God’s wonderful Heavenly City, all you have to do is ask Jesus to come into your heart!